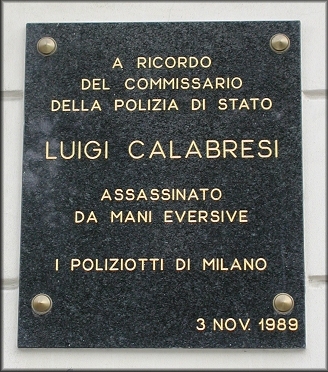 A shot from a pistol, then another, echoed through the Via Luigi Cherubini, near the corner of the Via Mario Pagano in Milan, then a man walked briskly from the scene, got into a car, and disappeared leaving Inspector Luigi Calabresi dead on the pavement. It was 17 May 1972. So ended the life of the policeman that much of the left held responsible for Giuseppe Pinelli’s death. 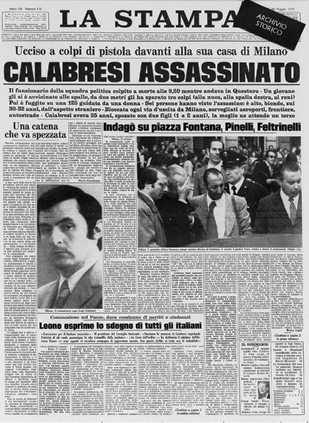 While many of the newspapers of the extra-parliamentary left, especially the weekly Lotta Continua, openly accused the inspector, the most often repeated slogans during protest marches were: “Calabresi — assassin” and “Pinelli, I will be avenged.” The walls of many cities were covered with posters depicting Calabresi with blood on his hands. As far as a substantial sector of public opinion was concerned, the inspector, born in Rome in 1937, was no longer a glittering and decorated public servant, always dapper with his designer jumpers and claiming to be a “liberal” who voted social democrat. He had become a protagonist in the strategy of tension. Lotta Continua’s press campaign became even more outspoken when reporters monitoring developments at the Palace of Justice learned that the investigation into Pinelli’s death was about to be wound up, with the police found blameless. 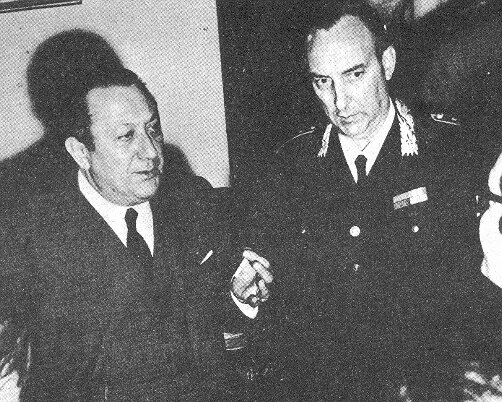 In fact, acting prosecutor Giovanni Caizzi closed the file on 21 May 1970. 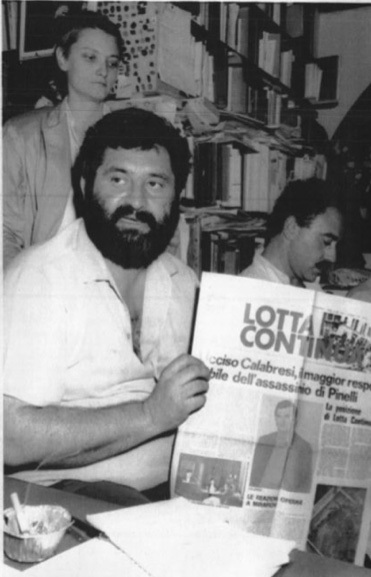 The intention of the editors of Lotta Continua was to provoke Calabresi — who had been rechristened as “Inspector Window” — to get him to sue the paper in order to reopen the “Pinelli case” before the courts. On 15 April, Calabresi brought charges against Pio Baldelli, Lotta Continua’s editor-in-chief, for “ongoing and aggravated defamation through attribution of a specific act”, to wit, responsibility for Pinelli’s death. But Milan’s prosecutor-general, Enrico De Peppo, delayed for over a month before assigning the case to a magistrate for investigation, and pressed Caizzi to finish his examination in the meantime. The trial was to begin once Caizzi had declared Pinelli’s death an accident. 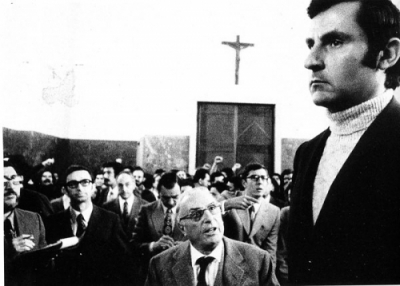 But there was also a film that was enjoying great success — Investigation of a Citizen Above Suspicion — directed by Elio Petri and featuring Gian Maria Volonté, with a soundtrack by Ennio Morricone. Audiences immediately identified the inspector played by Volonté as Inspector Calabresi. In court, Michele Lener defended Calabresi, and Marcello Gentili and Bianca Guidetti Serra acted for Baldelli. The judge was Carlo Biotti and the prosecuting attorney was Emilio Guicciardi. The court was surrounded by an impressive deployment of police and carabinieri. The opening session was packed to overflowing, with people shouting out “murderer” when Calabresi entered to give evidence. The inspector spoke of Pinelli as a decent fellow with whom he had swapped views. He had even made the anarchist the gift of a book (Enrico Emanueli’s Un milione di uomini) and Pinelli had reciprocated with a gift of Edgar Lee Masters’s Spoon River Anthology. He had handled Pinelli’s interrogation because he was under orders and inquiries were being made in every direction. In short, Pinelli’s questioning on 15 December had been relaxed, and only once did he utter the phrase: “Valpreda has talked.” But that was as far as it went. 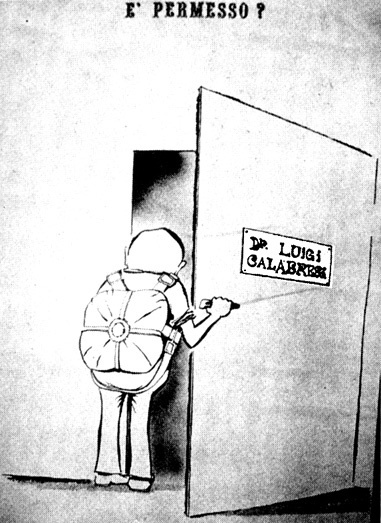 And when Pinelli jumped, Calabresi was in the office of his senior officer, Antonino Allegra. Calabresi failed to mention the threats he had been making for months against Pinelli when he realised he could not count on him to collaborate. “During a picket mounted in San Vittore in September to demand the release of the anarchists arrested for the bombings on 25 April, Calabresi had approached Pinelli and — after an exchange of words — told him angrily: ‘I’m going to make you pay’ ” recalled Cesare Vurchio from the Ponte della Ghisolfa circle, an eye-witness to that exchange. The other police officers trooped through the court during the succeeding sittings. The script never varied, down to use of the same phrases and terminology: ‘calm and relaxed”; “launched himself into the void”; “I received the news”. They gave the clear impression that they were all going through a lesson committed to memory. But there were noticeable departures from what they had told Judge Caizzi previously. The times had altered. The interrogation had not ended at midnight but at 11.30 p.m. The window had not been wide open, but closed on one side. Savino Lo Grano, newly promoted carabinieri captain, originally said he had watched Pinelli throughout and saw him throw himself from the window. Now, in court, he claimed he had seen no such thing: he had been looking at the open window while two police officers, trapped behind the shutters, had been unable to stop the anarchist. The case dragged on along similar lines for five more months, but in the end Baldelli’s defence lawyers scored their first victory. Pinelli’s body was to be exhumed and undergo fresh forensic examination. What were Gentili and Guidetti getting at? They wanted to check if Pinelli’s body still carried any sign of a karate chop delivered while under interrogation, the sort of blow that might have left Pinelli irretrievably disoriented and leading to the fall from the window. And that was precisely what Lener did not want to hear. The removal of Biotti was the ace card played by Calabresi’s defence at a point when it was perhaps still possible to establish — in spite of a year and a half’s having passed — how Pinelli died. The trial quickly became bogged down. 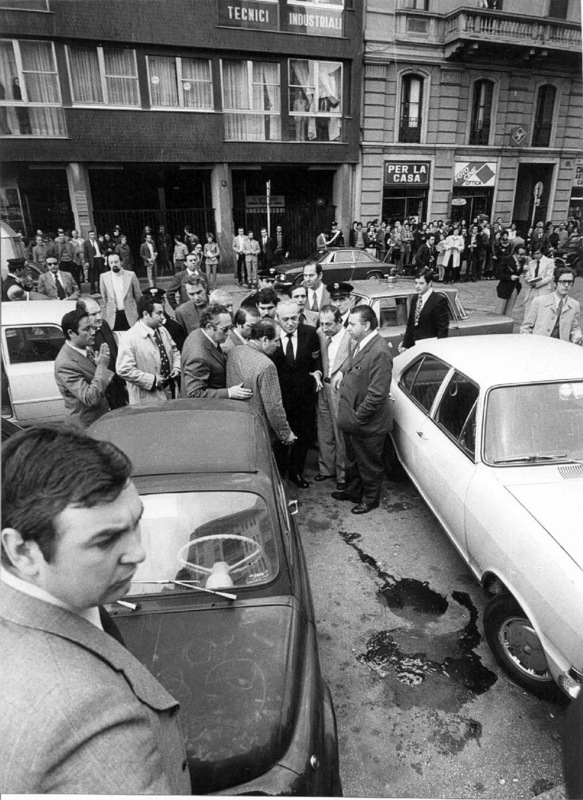 A further investigation was launched into Licia Pinelli’s — Guiseppe’s widow — complaint to examining magistrate Gerardo D’Ambrosio which led to manslaughter charges being brought on 4 October 1971 against the police team which had interrogated Pinelli: Calabresi, Lo Grano, Panessa, Giuseppe Caracuta, Carlo Mainardi and Pietro Mucilli. 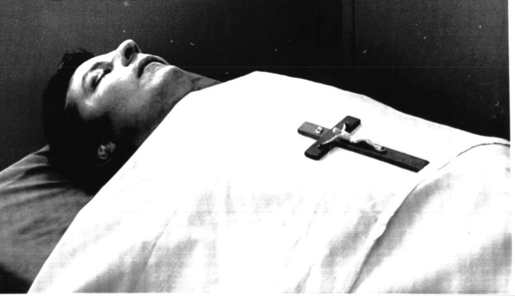 D’Ambrosio had the anarchist’s body exhumed on 21 October. But, as lots of scientists and physicians had argued, given the advanced state of decomposition, it was by then hard to discover anything. But the “Calabresi case” refused to go away. On 17 May 1973 a monument to the inspector was unveiled in the courtyard of Milan police headquarters to mark the first anniversary of his death. The ceremony was attended by Interior minister Mariano Rumor. Gianfranco Bertoli, having recently returned to Italy from Israel, threw a bomb at the entrance to the headquarters. His intention — as he declared after his arrest — was to get the authorities paying tribute to Calabresi, but a police officer had kicked the device away and it had ended up among the crowd. Carnage ensued: four lives were lost and nearly 40 people were injured. Bertoli claimed he was an individualist anarchist. But nearly all the press described him as a fascist and cited a series of previous actions (attacks on leftwing party premises and others) that were to fall through during the trial. 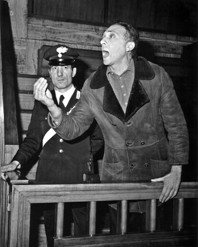 Born in Venice in 1933, Bertoli — a member of the PCI’s Youth Federation up until 1952 — had a record as a petty criminal and had been in and out of jail for years. He was sentenced to life imprisonment on 9 March 1976. From 1993 Bertoli enjoyed an open prison regime. But his case still held a few surprises in store. It would seem (the conditional tense is de rigueur in this tale) that fresh information has since surfaced regarding those who had somehow incited him to carry out his deed — protagonists of the strategy of tension, perhaps. So who killed Calabresi? There was silence on that front up until 2 July 1988 when Leonardo Marino, a former FIAT worker and ex-member of Lotta Continua, gave himself up to the carabinieri in La Spezia (he sold crepes from a kiosk in nearby Bocca di Magra). He wanted to come clean about his and his colleagues’ part in the Calabresi murder. But 17 days were to elapse before he signed a statement. Why? That remains a mystery. He was taken to Milan, and it was a further seven days before he made a full confession. Another mystery. 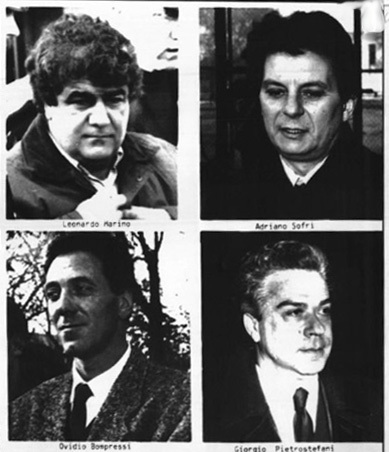 On 28 July, in addition to Marino, Adriano Sofri, Ovidio Bompressi and Giorgio Pietrostefani were arrested. Sofri had been the unchallenged national leader of Lotta Continua and Pietrostefani was the movement’s leader in Milan. A lengthy procession through the courts began. The charges were based exclusively on Marino’s confession that he had driven the getaway car, Bompressi actually committed the murder. Sofri and Pietrostefani had given the go-ahead. The initial verdict was handed down in July 1991. They were all found guilty as charged. The conspirators and perpetrator received 22 year sentences, Marino 11 years. On 23 October 1992, the Court of Cassation dismissed the verdict on the basis of insufficient motive. So, on 21 December 1993 the Appeal Court of Assizes cleared them all. The verdict was thrown out again on 27 October 1994, and a third Appeal Court confirmed the 22-year sentences passed on Sofri, Bompressi and Pietrostefani, while Marino, thanks to extenuating considerations, saw his case dismissed. On 22 January the Court of Cassation had the final word and confirmed the convictions.